While this is not the first time I have written about the impact of the compression effect on future home values in Tallahassee, it is the first time that I have produced a graphic that clearly portrays its meaning. If you own a home or plan on buying a home in Tallahassee, it would be prudent to understand how this developing trend might impact the value of your home when it comes time to sell. In order to understand what the compression effect is all about, we first must understand the relationship between the supply of homes for sale and the demand for homes in Tallahassee. 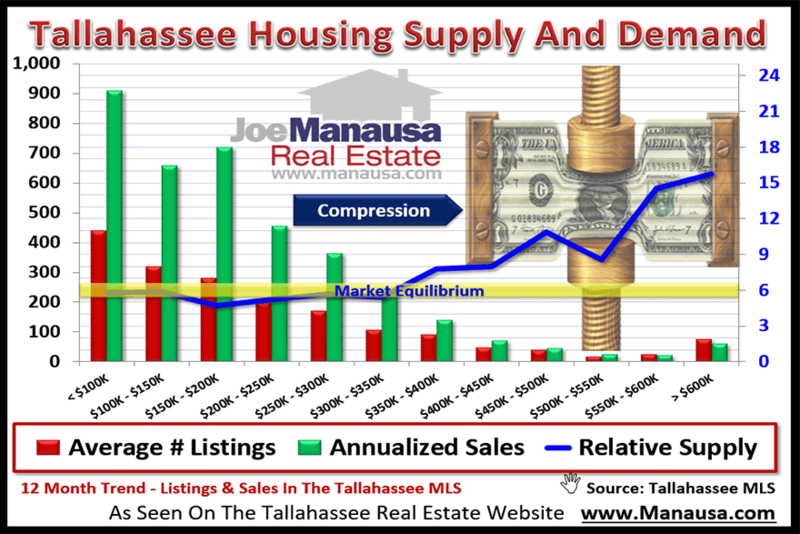 The following graph measures the relative supply and demand for homes across all price ranges in Tallahassee. There's a lot going on in the graph above, but it is much more simple than it might appear at first blush. What we're really tracking here is the "relative" supply of homes ... meaning the total inventory of homes for sale measured at the current rate of consumption. 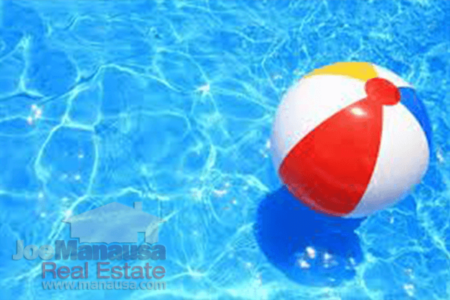 In other words, relative supply is the current supply of homes for sale relative to the current rate of demand from buyers, measured in "months of supply." We track the average number of listings by price range (red bars measured on the left vertical axis)d, and the average number of homes sold by price range (green bars, also measured on the left vertical axis). Comparing the two creates the blue line, which is the relative supply of homes (measured in months of supply on the right vertical axis). Most real estate professionals consider 6.0 month of supply a balanced market (market equilibrium), a condition where neither seller nor buyer have an advantage in negotiations. We identify this with a yellow band on the graphic above. When the blue line falls within the yellow band, the market is in equilibrium. When it falls below the yellow band, it means that the supply of homes is not adequate for the current rate of demand, thus it is a seller's market, meaning buyers are competing for homes and homes that are priced correctly often receive multiple offers. When the blue line rises above the yellow band, it means that the number of homes for sale is too much for the current rate of demand, thus it is a buyer's market, meaning sellers are competing for the few buyers in the market and they often must make significant price concessions to sell their homes. Based upon the graph above, Tallahassee is experiencing all three types of markets right now. Overall, homes valued below $350,000 are in market equilibrium, though those from $150,000 to $250,000 have entered a seller's market. Homes priced above $350,000 remain in a buyer's market (going on ten years now). Of course, this graph is for ALL of Tallahassee (Leon County), so once you drill down to sections and subdivisions, relative supply measurements will differ from the overall market. The graph above shows the supply of homes for sale below $350,000 is dropping. In most markets, when supply declines below equilibrium, producers step in and generate new supply. Well, in the Tallahassee real estate market, builders will not be able to do this much longer. The cost of development, as well as the cost of construction have both soared. Soon, the cost of land will shoot significantly higher too. So we've identified a growing demand and we understand that historical solutions will not fully apply. I suspect that we are going to see growth in multi-family properties in Tallahassee, and the "new normal" for home builders will be far fewer new single family homes than what they were accustomed to building in the 1990s and early 2000s. What they can build however, is high end homes. The new construction of homes over $300,000 is at an all-time high. Mortgage interest rates are near an all-time low. The combination of these two factors means that home affordability is so cheap that people are getting much more home (spending amount) for their monthly mortgage payment than they have in the past. Today's buyer who would be purchasing a $350,000 home if interest rates were at their 50 year average (8.29%) are instead buying a $600,000 home because they can borrow money at 3.44%. Low interest rates are pushing this market, and fortunately, it looks like low(ish) rates will be around for some time. But consider the impact of rising interest rates on the highest end of the market. Is it unrealistic to expect interest rates to return to 5% within the next few years? 6%? Well, a return to 5% would reduce the high-end buyer pool to 50% of its current size. Assuming Tallahassee continues to grow like it has (or has not) over the past 160 years, we should not expect a flood of high-end homebuyers to show up here. Instead, we should see the steady growth of Doctors, Lawyers, and Business Leaders to continue to take their same share of a slowly growing housing market. But we've seen an explosion of growth in high end homes since 2000. It is unrealistic to assume that we will have the demand for these homes when interest rates rise and people begin to want to move. Even today, the high end resale market is sluggish as a large percentage of today's luxury home buyers are choosing new construction over resale. So we are finally getting around to the point of this article, which is how real estate supply and demand, driven by low mortgage interest rates, coupled with the capabilities of new home builders, are filling the market with homes that will become unaffordable when interest rates move to normal levels. This is going to create a compression effect in the housing market, where median priced homes (homes in the middle) want to move higher in value while homes at the top want to fall in value. The result of these two forces coming together will stifle the natural progression of appreciation and could create a slowly moving zone of home values that "never" change. Imagine 20 year's supply of homes worth $600,000 or more in an interest rate era that returns to 9%. If you own one of these homes, how many people in Tallahassee will be able to afford them? Yet if you own a $200,000 home, there will be a waiting list of ready buyers, meaning you can expect to get more for your home. Somewhere between these two points will be a compression zone where values get caught up in a twilight zone episode, potentially for a decade or more. Over time, inflation will push this zone higher and help eradicate it. Short of Tallahassee bringing in new industry, its impact will be felt in Tallahassee for a long time. The only question is "when" this effect will be felt, no "if" it will occur. Pay close attention to mortgage interest rates if you want an early warning! 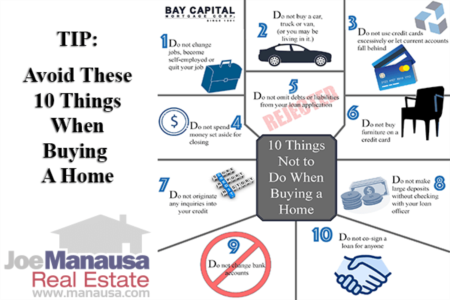 So how do you take all this information and use it wisely when you buy your next home? Simple. Speak with an expert in the housing market, share your short and long-term goals, and then utilize the guidance developed for your specific information. The compression effect will be bad news for some, good news for others, and the guidance that you get today could very well decide which side of the boat you are on.